On the weekend DaddyMopar, Squeak and I attended the Bendigo Swap Meet, a large swap meet held at the Bendigo showgrounds. If you are unfamiliar with a swap meet, they are mostly car parts and memorabilia, with some older-wares as well. Car workshop manuals are of interest to me, as well as old kitchenware, and memorabilia. DaddyMopar loves his car parts, but he only got one car part, a rubber dust boot to go on his car. I got my dad’s father’s day pressie, a car workshop manual for one of his 1930s cars. Even though father’s day was a few months ago, I felt this was the perfect pressie. He loved it! It is great to have collectibles to go with old cars. I bought myself a cookbook from the 40’s, with some unusual recipes like fish pudding, and boiled terrapin. There is also instructions for buying fruit, setting a table, and carving meats. I haven’t had a good look, but it was only $8, so I am sure it will be worth a read, and have some good recipes in it, and a few that I would consider odd some 70 years later. I love old cookbooks, some of the recipes are brilliant, and there are some wonderful desserts. I tend not to be so fond of the more ‘modern’ cookbooks, as I love comfort food. I do find Nigella Lawson’s, and some of Jamie Oliver’s recipes very good. 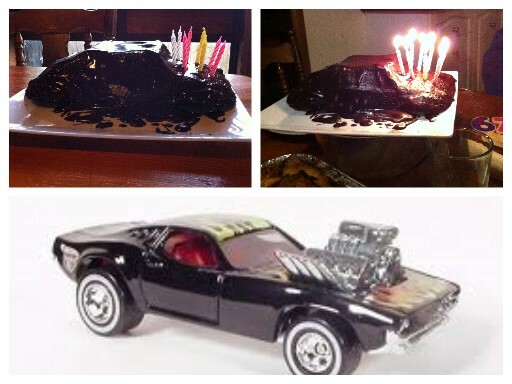 Do you like my Car cake?? It’s DaddyMopar’s birthday later this week, so I thought I would cook a pot roast and a carrot cake to celebrate!! I bought a rolled brisket from Coles supermarket a few weeks ago and froze it. At the time my only knowledge of brisket was the jokes in ‘Big Bang Theory’about brisket cooked by Howard Wolowitz’s mother. While mine was cooking in the oven I researched a bit about brisket and what they are referring to is totaly different to what I served up. My brisket is a similar cut to corned beef. There was a recipe on the back of the vaccuum bag, so I followed it loosely. I browned the beef, then added chopped up carrot and onion, a spoonful of homemade veggie stock I keep in the fridge that I made in the Bellini. 2 cups of water, bring to boil then into oven for 3 hours, and I was supposed to turn hourly, but I forgot. I don’t think it made any difference to the finished result. 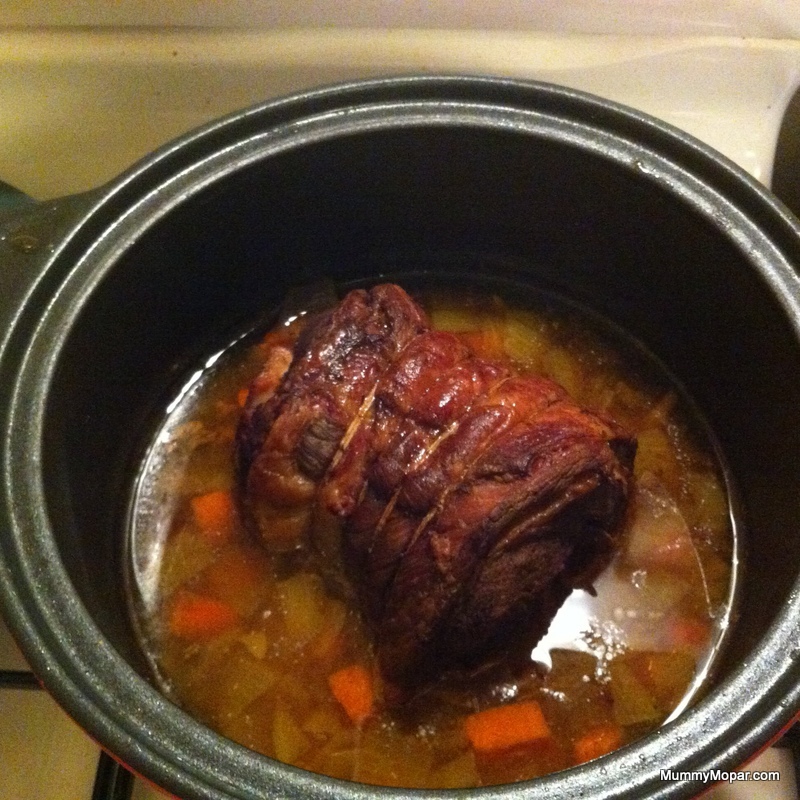 I used my favorite casserole dish with lid, its a Microstoven. Nonstick, microwave, oven and stovetop safe. Dishwasher too. It was a xmas gift from my brother-in-law and I’ve had it for almost 3 years. I’d be lost without it. After 3 hours in the oven, then half an hour with the lid off, Its time to take it out! I also cooked roast potatoes and carrots to go with it. 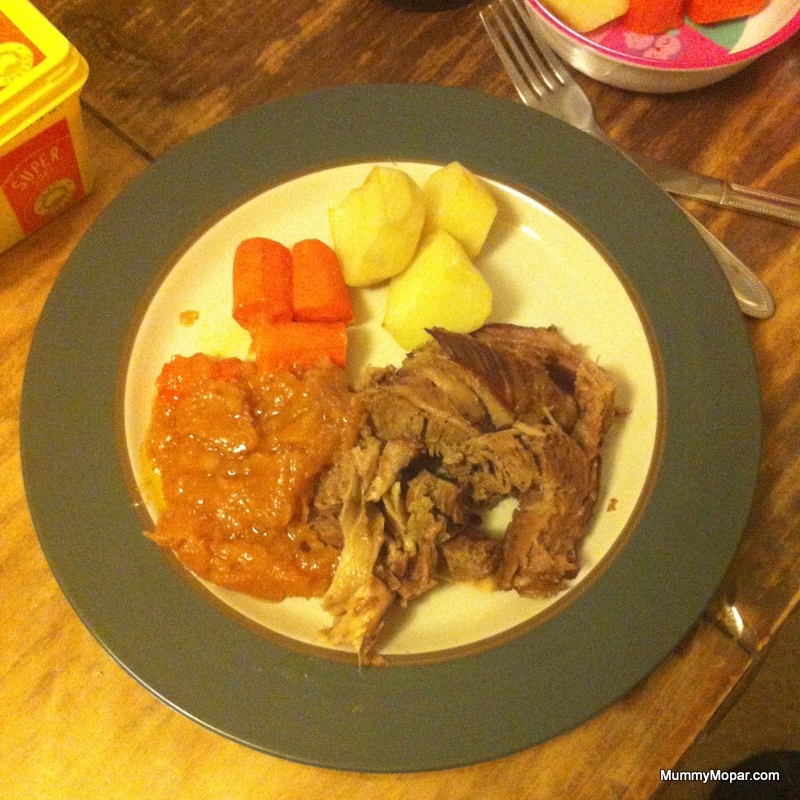 I used the roast juices to make gravy, but it turned out more like a relish. Delicious anyhow. 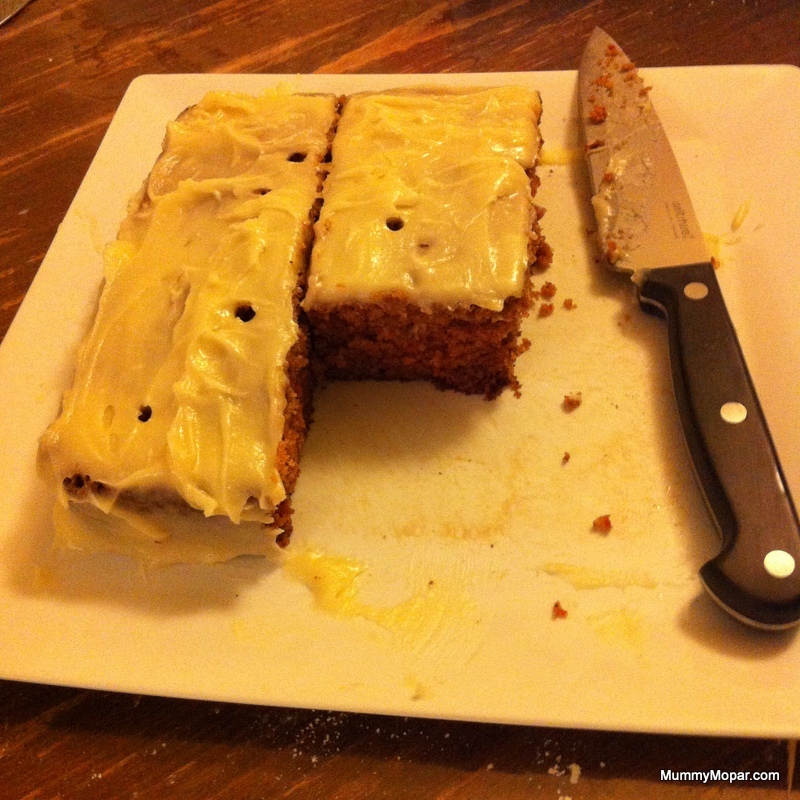 For the birthday cake I made a carrot cake with cream cheese icing. I have made DaddyyMopar a carrot cake every birthday since we met. The recipe is from one of my Nannie’s cookbooks. I made it in the Bellini as I don’t enjoy grating carrots. The Bellini made it extremely quick, and I find it very easy to convert recipes to suit the Bellini. I’m hoping cakes like this, and other nice treats will be frequent to my kitchen. It was delicious, despite it’s looks. The holes in the top are from the candles, as no birthday cake is complete without candles and singing.